The spy world is intriguing or at least that’s what most people think because they know very little about it. Spies are people that operate behind enemy lines in order to inform their governments about any potential treats. There are numerous spy agencies throughout the world and they are often associated with numerous urban legends and conspiracy theories. Here are several interesting facts about spies that will help you realise how insane their line of work is. Gevork Vartanian was a Soviet intelligence agent who during World War II indentified over 400 Nazi agents. However, this wasn’t his greatest accomplishment. At the age of 19, Vartanian uncovered a Nazi plot which aimed the capture or assassination of Churchill, Roosevelt and Stalin during a meeting in Tehran, Iran. The operation was known as “Long Jump” and if it had been successful it would have certainly altered the war in favour of the Germans. His role into the operation was kept in secret until the year 2000 when his identity was finally unveiled. He died in 2012, at the age of 82 as a Hero of the Soviet Union. During World War I, the Germans used a steel tree to spy on their enemies. They cut down a real tree near the Allied Powers camp and replaced it with their fake tree, while firing artillery in order to mask their action. The faux tree was discovered by the allies several months later after they had regained total control over the area and pushed the Germans away. Spies use coded communication to transmit their messages to their governments. The Navajo Code is one of the very few military and espionage codes to never be broken. It was used by the Allied Powers during World War II and it is based on the Native American language of the Navajo people which is regarded to be one of the hardest languages known to mankind. The Enigma Code was used by the Germans and just like the Navajo Code it was regarded as an unbreakable code until British mathematician Alan Turing created a machine that could decrypt it. 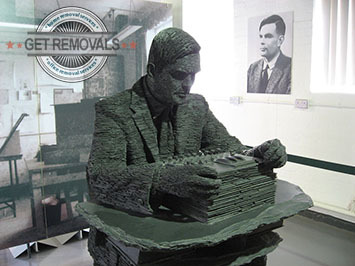 Historians and statisticians believe that Turing’s achievement shortened the war by up to four years. British spies are known for posing as absent minded tourists during their recognition missions. They also tend to use silly professions for cover up. You can learn more interesting facts about the world of spies, by visiting the spy section of the Imperial War Museum in London while the movers are handling your removal to the English capital. By using professional man and van services you will drastically facilitate your relocation and more importantly you will have more free time to do interesting things. Don’t hesitate into using removal services as they are quite affordable. Funny fact: During the 19th century a French ship ran aground in the United Kingdom. The only one to survice through the shipwreck was a monkey. At the time Britain and France were at war and according to an urban legend a local fisherman indentified the animal as a spy and questioned it before hanging it for spying.